Kangra painting or Pahari painting is a form of art that originated in the hilly regions of the state of Himachal Pradesh in India. It gained popularity between the 17th and 19th century under the patronisation of the Rajput rulers of the kingdom. A typical Kangra painting depicts the scenic landscape of the region – hills, brooks, verdant greenery with special attention to the foliage- flowering plants, creepers and leafless plants. Painters use cool and delicate colours made of vegetable and mineral extracts. 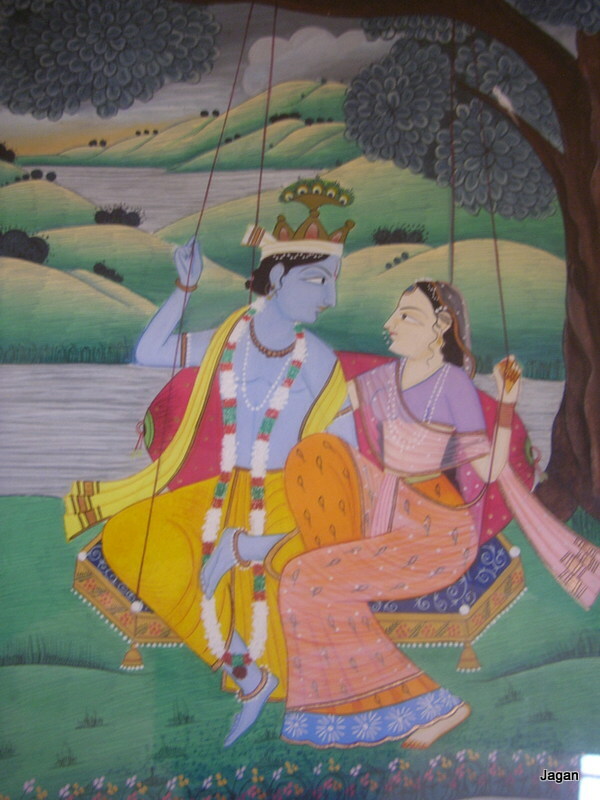 The most common subject for painting are the stories and legends of Lord Krishna. Later, other subjects such as kings of the Mughal dynasty and other mythological characters were also introduced. There are many organisations and schools in the region that now offer courses in this form of painting to keep the tradition alive and to create opportunities of employment among the locals. This particular painting was made by a speech and hearing impaired artist, a member of a self-help group in the Kangra district. never heard of Kangra Painting before, thank you! You’re welcome! It is one of the lesser known forms of painting. A beautiful painting with an inspiring and magical story to tell. love it! Thanks IT! I like to collect paintings that are rural-based or a traditional form.